I hope you didn’t think I’d disappeared. My sore throat ended up morphing into laryngitis and a bad upper respiratory infection and we were out of town. I’m just now starting to feel normal again. To give you any indication of how bad I’ve been feeling, I haven’t worked out since Friday morning. Whatever was going on in my chest was not good and I needed to rest. In slightly more interesting news, we did a five-course chef’s tasting dinner at Woodfire Grill on Friday night. For those of you who aren’t familiar, it’s Top Chef contestant Kevin Gillespie’s restaurant in Atlanta. I’m going to post a recap of that dinner tomorrow night and my experience meeting Kevin! And now onto the food you see pictured above. I found this recipe for Chicken Hawaii while I was searching for older recipes to make for the 68 Days of Gourmet project. 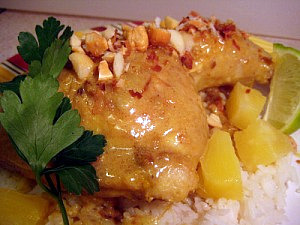 The recipe was originally published in 1953 and featured some of our favorite ingredients – coconut, curry, pineapple, chicken – it was a must try. I was so excited about serving the coconut curry braised chicken with all of the fun toppings – lime wedges, pineapple, toasted coconut and chopped macadamia nuts. It smelled amazing while it was cooking but then kind of fell flat in the flavor department. I was so disappointed. There just wasn’t enough curry flavor and it was kind of bland. I was explaining the lackluster dish to my dad and he made a good point, the whole can of full fat coconut milk that I added to the curry mixture probably just washed out the flavor. And he made another funny point that in the 1950s people were really just starting to experiment with bold flavors and served a lot of bland dishes. Maybe this was pretty cutting edge in 1953! So while I won’t be making this again, I still enjoyed cooking it and liked the idea of serving the dish with toppings so it can be customized to each diner’s taste. Rinse, pat chicken dry and season with 1/2 teaspoon salt. Heat oil in a 6- to 8-quart heavy pot over moderately high heat. Brown chicken, turning occasionally, 8-10 minutes. You will probably need to do this in 2 batches. Transfer to plate and reserve fat in pot. Add onion, ginger, garlic, cinnamon sticks and bay leaf to fat in pot and cook, stirring occasionally, until onion is browned, about 5 minutes. Add curry powder and flour and cook over medium heat for 1 minute, stirring constantly. Stir in sugar, coconut milk and remaining 1/2 teaspoon salt. Bring mixture to a boil, stirring and scraping up brown bits from bottom of pot. Return chicken and any accumulated juices to pot and reduce heat to a simmer. Cook, covered, stirring occasionally, until chicken is cooked through. This should take around 20 minutes or until a thermometer registers 165 degrees. Discard cinnamon sticks and bay leaf. Season with salt to taste. Serve chicken over rice with sauce from pot and toppings. and how cool is it that you can bounce ideas about cooking off your dad!